Garlic scapes are those long curly green steams that shoot up from garlic bulbs. Normally you cut them off to send more energy to the garlic bulbs to grow. Yet, instead of tossing the garlic scapes away you can make an amazing pesto. 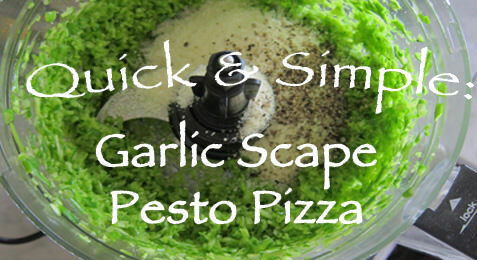 Garlic scape pesto is great on almost everything including homemade pizza! You can find the recipe for Garlic Scape Pesto here!